BBC Online is reporting that the BBC is to make a new retelling of the Crucifixion story which will run over 6 nights in the run up to Easter 2008. It's obviously very early days in the life of this potential film, and it's unclear from BBC1 controller Peter Fincham's words whether this will be set in a contemporary setting, as the recent Manchester Passion (which I will be reviewing on Tuesday) was, or whether it will be set in the original setting like Jesus of Nazareth (which the article also cites). Either way it sounds like an exciting project, and it's nice to see BBC1 giving some air time to some religious dramatic work. That sais we will have to wait and see both whether it will be any good and, in fact, whether it will happen at all. "I don't yet know whether the Passion will happen," Mr Fincham said on Wednesday, "but it's an example of something that I believe that the BBC, and in particular BBC One, should do." 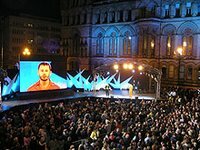 A BBC spokeswoman added: "It's an idea that's in development but has yet to be commissioned...It would look to build on the success of Manchester Passion, which brought a whole new audience to the story." Having reviewed the Jesus mini series yesterday, I thought I would follow it up as normal with a scene guide. The gospel citations here follow the usual rules. There are actually two different version of this film in circulation. The one I am most familiar with is the International version which concludes with a scene where the modern day Jesus meets some children in Malta (I believe). The US version is the one where Mary recalls Jesus as a child resurrecting a bird, an episode not dissimilar to one from certain versions of the Infancy Gospel of Thomas. There are only a few differences between the two versions, and most of them relate to the incidents not found in scripture. Those changes which do relate to scriptural incidents are minor. Full details of the differences between the two versions can be found at Hollywood Jesus. 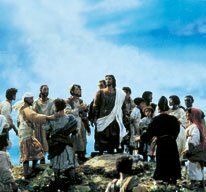 This film is a prime example of the harmonising tradition in Jesus films. Rather than exclusively or primarily following a single gospel it blends all four together. Hence key incidents exclusive to John, such as the wedding at Cana, raising of Lazarus and some of the resurrection stories are included. Whilst this is not uncommon, we also see the script writer Suzette Couture pick and choose the most vivid incidents from each of the synoptic gospels. 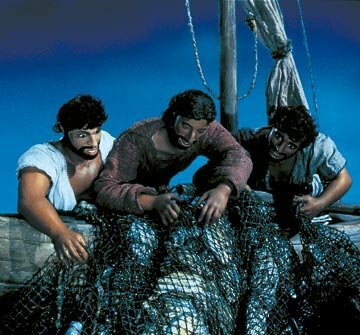 Hence Luke's version of the call of Simon Peter (where he is only convinced after a miraculous catch of fish) is included in preference to the more mundane version in Matthew and Mark. This is of course only after John the Baptist has dramatically pointed out Jesus to Andrew and John. The interaction with between Jesus and Mary and Martha is only found in Luke's gospel yet included. Similarly only Luke's gospel puts Jesus on trial in front of Herod, and only Matthew has Peter attempt to walk on water and Judas hang himself. As a result of this and my familiarity with the film I've made more effort to locate the exact story where it seems warranted. It's also noticeable how this film opts neither for the single trip to Jerusalem we find in Mark's gospel (and the other synoptics), nor the threefold trip to Jerusalem unique to John's Gospel. Whilst it is difficult to be precise (and unclear whether this was intentional on the part of the writer) it would appear that both parts of the film start in Galilee, and end in Jerusalem. Hence at the end of part 1, Jesus visits and clears the temple, before returning at the start of part 2 to the Sea of Galilee, to pick his diciples. and meet them across the water. The other distinctive thing about the screen play is the prominence it gives to women. Many Jesus films have taken a number of different women and boiled them down into one> Usually this is achieved by making Mary Magdalene not only the woman who witnesses Jesus's resurrection but also the woman of sinful life who anoints Jesus, and the woman caught in adultery. Jesus Christ Superstar even portrays her as mothering Jesus as well - in a manner reminiscent of the Virgin Mary. By contrast this film gives a detailed portrait of a number of many different women around the life of Jesus, being at pains to make them distinct. So, whilst Mary Magdalene is, in keeping with the old western tradition, a reformed prostitute, it is another woman who is caught in adultery. Mary of Bethany is distinct again - shown as the woman Jesus had to leave behind to fulfil his calling. Jesus's mother also has a prominent role, and even Herodias and Salome get an above average quantity of screen time. Furthermore, there is the story of the Syro-Phoenician woman (which appears in no other Jesus film), not to mention Martha. Admittedly, the film excludes the Samaritan women, Jairus's daughter, the haemorrhaging woman, and the crippled woman who was healed on the Sabbath but I imagine screen time was a limiting factor. Nevertheless the prominence of women in this film combined with the way Jesus treats them in particular in this film, make this film particularly appealing to many women. Finally there is the closing scene in the international version where Jesus appears as a modern man. Interestingly most British viewers I have encountered consider this scene very American, which is ironic since that is one of the few places it was not shown. There is also a difference of opinion as to whether this scene is a plus or a minus. Amongst others, I know that Mark Goodacre considers it a plus point, whereas I would strongly disagree. I'm not sure whether it's the music, or the children that I find grates. Certainly I like the idea of showing Jesus's relevance for today, but this ending just doesn't do it for me. This film is not based upon the Gospels but upon this fictional exploration of the eternal spiritual conflict. Whilst this didn't prevent the protests and objections it was no douby intended to, it did create some space for Scorsese to explore aspects of the life of Jesus which the gospels do not. 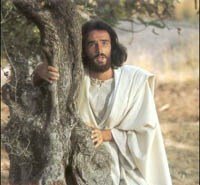 In order to acheive this Jesus imports a greater proportion of non-biblical episodes into its script than any other Jesus film apart from Last Temptation, and uses the gospel material sparingly. As the film approaches its halfway point, Jesus has only really been baptised, tempted and joined by a few disciples - the events of his birth and childhood are only briefly sketched out in a couple of flashbacks. The second half is not dissimilar. A couple of miracles and a bit of teaching, and the film moves into Holy Week. Many considered this to be the film's greatest weakness. I would strongly disagree. In contrast to Last Temptation the extra-biblical material this film offers feels like it could reflect what actually happened in the life of the Jesus we find in the gospels. Of course we are not told when Jesus's father died, or if he struggled to find work, or if he ever loved anyone, nor do they tell us how he reacted when he encountered zealots. But, by and large, all of these are certainly possibilities - many of them probablities extraploated from what we know from other historical sources, or from what he said and did that the gospels have recorded. The effect of this is to present a very human Jesus. One of the most powerful scenes in the films comes when Joseph dies, and a cocktail of his grief, aloneness, responsibilities and the cost of him doing God's will cause him to breakdown and weep. 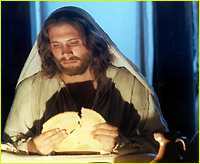 This is a Jesus we could relate to, who emptied himself to become fully human. The other major way the film uses its extra-biblical material is to sketch something of the historical context that surrounded these events. Of course time, and the demands of populist TV allow only a brief impressionistic sketch, rather than a detailed historical portrait, but compared to the lack of historical context surrounding many popular Jesus films, such as The Passion of the Christ, this is a major asset. Perhaps more than any other film this one demonstrates the politics at play, to which Jesus ultimately fell victim. Pilate, (played by Gary Oldman) is undeniably in charge. Caiaphas is shown early on as an heroic figure, risking his neck (quite literally) to preserve vital Jewish religious privileges. Although he still plays a pivotal role in Jesus's death, his actions seem primarily motivated by his desire to quell a potential uprising that history suggests frequently bubbled beneath the surface. Ultimately, Pilate's cunning manipulates Caiaphas in such a way as to leave the high priest taking the blame, while passing himself of as compassionate. It's possibly the most satisfactory visualisation of the almost noble Pilate presented in the records of Jesus's trial and the brutal scheming butcher that history presents us with. But no Jesus film is perfect - in fact they rely on each other to cover their backs so they can explore certain aspects more thoroughly - and this film is no exception. Perhaps this film's main weakness is that it wants us to like its Jesus too much, and doesn't trust itself as much as it should. Hence, the scenes of him playing around with his disciples, which start out as a breath of fresh air, eventually turn into an unwelcome draught. Whilst it does well at establishing a Jesus we can relate to, and banishing the traditional image of a boring and irrelevant Jesus, it fails to clothe him with any authority, or his actions with much significance. That said, Jesus remains one of the strongest Jesus films of the last 25 years, and it is pleasing that eventually it has been released on DVD in Britain. A few years ago Lee Jackson, one of my best friends, wrote a book and offered my the chance to write a chapter for it. Like a fool I declined saying I had too much on. 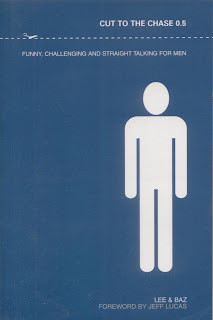 Ultimately the book was a book for real Christian men called Dead Men Walking and did reasonably well over here - certainly a lot of blokes seemed able to relate to it. The following years were spent kicking myself for turning down such an opportunity. So when Lee told me he was going to write another book, with his co-writer Baz Gascoyne, and again offered me the chance to contribute, I took him up on his offer and overcompensated and submitted four chapters. Sadly they had a mountain of material and the two longest (and best) chapters didn't quite fit with the style of the rest of the book and so didn't make the cut. But the good news is that the two (page-and-a-half) "chapters" I dashed off after writing the longer ones were just what they were after, and so are being printed pretty much now. That said if anyone is at the National Coalition of Men's Ministries Spring Conference in Denver, or at a few other random locations across the US over the next couple of weeks you'll be able to catch Lee and Baz, and buy one of the first 200 copies of the book, called Cut to the Chase, that have been digitally printed especially for their US tour. Everyone else will have to wait with me for the book's release in mid-May, although you can pre-order it from them direct, or from Amazon. The good news is that the chapters that didn't make the cut are available to download for free from their website. I'm really pleased about this as I much prefer the two chapters that are here than the ones in the book. There also more likely to be of interest to readers of this blog. The other chapter Lost in Translation, looks at more interactive ways of reading / studying / understanding the bible. Amongst the things I discuss are, of course, the use of Bible Films, as well as Bloke Art and using the comic imagination. The page needs a bit of reformatting (and I have nothing to do with the opening quote and picture! ), but it gives a good intro to some of the things I'd dearly love to see become more commonplace. Walter Wink has written a book on a similar subject called Transforming Bible Study which I'm hoping to borrow soon. Firstly apologies for the lack of a post yesterday. There were problems with Blogger which seemed to have sorted themselves out. I'm amazed at how angry some people get on the Blogger Help Forum. Whilst not being able to post is a bit annoying, Blogger does give us web space and blogging software for free. Perhaps I'm just being naïve. I always wonder with things like this how they devised them. For a start it is strange that they have done a top 12 rather than top 10. I can only assume that this is because they felt they had to include the major film Jesi down to Hunter and von Sydow, but also wanted to include lesser known portrayals such as Bale, Ferrell, Donovan and Sarandon. There are two films on the list that I have yet to see. Like Peter, I'd not heard of Ferrell's turn in Superstar (1980), and will have to see if I can dig it out. On the other hand I've known about The Day Christ Died (1980) for a long time, but sadly it's not available to buy. The limitations of the list are not to hard to spot. Firstly, all these films are American. Whilst I can understand that Entertainment Weekly is a popular magazine, and trying to write for as wider readership as possible, would it really have hurt them to have included Enrique Irazoqui from Pasolini's Gospel According to St. Matthew (1964)? Similarly the list only covers the last 45 years. Whilst going back this far is, in itself, a positive step, it would have been nice to choose a film from the silent era. Personally, I'd include Robert Henderson-Bland's performance in From the Manger to the Cross (1912). Thirdly they seem to have deliberately excluded all church sponsored projects like the Visual Bible's Gospel of John (2003). 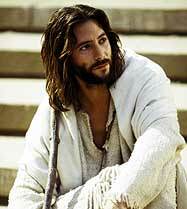 Whilst some of these church films are awful, Henry Ian Cusick's performance at least deserves a nod. The final flaw is that by so limiting the available selection, the list really becomes a no-brainer. 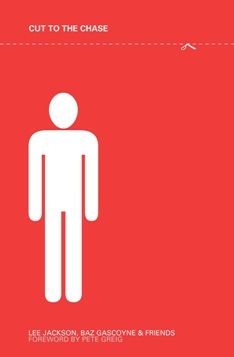 It's hard to think of a portrayal that fits the presumed criteria that isn't included. Anyway, it's easy to criticise, without offering anything in return, so here's my list. I should add that I was mainly voting on the basis of the actor's performance given what they were asked to do. Admittedly there's some guess work as to where the actor's performance starts and teh direction ends, but even so that seemed to be the best way to do it. So, take Bruce Marchiano, in places some of the things he has clearly been asked to do are crass (e.g. emptying a jar of water on a disciple's head during the Sermon on the Mount), but a lot of his work is very good in my opinion. Finally, a while back there was a discussion on Arts and Faith called "Who's Your Favourite Film Jesus?" which was also discussed at NT Gateway and Codex. For what it's worth I voted for Jim Caviezel, although I regret that now. Predictably, he and Robert Powell were way ahead of the rest. There's also another top ten Bible Films list at my favourite everything. I briefly touched on the documentary The Bible According to Hollywood back in March when discussing the recent Channel 4 documentary The Passion: Films, Faith and Fury. I decided it might be interesting to get hold of a copy and compare the two. Essentially the two are trying to different things. "The Passion: Films, Faith and Fury" was primarily concerned with the rocky relationship between the film industry in general and the church, and arranged its material neatly in accordance with that goal. "The Bible According to Hollywood" on the other hand is far more concerned with Hollywood proper (i.e. specifically films made by Hollywood studios). It also focussed more of its attention on showing clips from the films (although usually just bits from the trailers which are talked over by a voiceover). Those are of course generalisations. This film does include some interesting interviews - notably Charlton Heston - although it is always unclear which parts are uique footage, and which are simply borrowed from elsewhere. There is also some discussion on the Italian Epic film industry. There are immediate pluses and minuses then. "Films, Faith and Fury" was clearly the more expensive, and well put together film, and the array of interesting interviewees made it really special. "The Bible According to Hollywood" on the other hand had more clips and was able to show parts from very rare bible films, some of which I had not seen anything from. The main selection of clips which I had not seen were those from cheap / less serious / exploitational films notably of the late fifties to early seventies, involving either Adam and Eve, or Samson and Deliah. So there are clips from the Mexican film Adam and Eve (1958 - pictured right) whose main attraction was a former Miss Universe in the lead role, The Sin of Adam and Eve (1972), The Private Lives of Adam and Eve starring Mickey Rooney. More interesting was the clips from some of the earliest Bible films including Noah's Ark (1928) and D.W. GRiffith's Judith of Bethulia (1916 - pictured). There is also some stills the now lost 1921 version of The Queen of Sheba. Both of those latter two films were re-made by Italian studios in the golden age of the epic and there is footage from the 1960 Judith of Bethulia and 1952 La Regina di Saba. 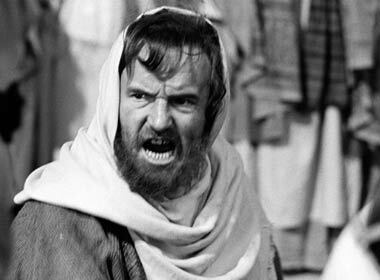 The New Testament section skips past the many film versions of the life of Jesus only to spend far too long stuck on the Roman-Biblical Epics such as Ben Hur and The Robe. Whilst there is some interesting footage of the original versions of Ben Hur (1907), Quo Vadis (1912), and Salome (1918). Perhaps most interesting was the inclusion of some footage from Civilization (1916 - pictured right). This stars George Fisher as Jesus who appears superimposed on footage of world war one (as far as I'm aware the footage was of actors not real footage). The film appeared in 1916 halfway through the war as a cry to keep America out of the war, and was incredibly popular until America joined her allies the following year. I suppose this was probably the first time an Akerican anti-war film was made, which seems a million miles away from today where almost every film that gets released is examined for politcal arguments in the subtext. Anyway, "The Bible in Hollywood", certainly has enough going for it to make bible film affectiandos stump up a few pounds to catch a few glipmses of films they've not seen, even if its low production values will give you a few chuckles as you go. Biz Community, a news outlet in South Africa, has a story that South African modernised Jesus film Son of Man will be playing as part of a 25 year celebration of the Sundance Film Festival. 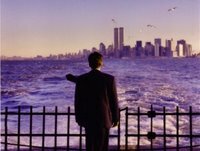 Sundance Institue at BAM will be showing in New York, from the 11th to the 21st of May, at the Brooklyn Academy of Music. It will include "films from the 2006 Sundance Film Festival, live music from emerging composers, programs that reveal the creative process, and discussions with filmmakers". In case you've not heard of the film before it gained incredible reviews at this year's festival including ones from Roger Ebert and John Horn of the LA Times. I've posted on this film four times already (Blog post 1, Blog post 2, Blog post 3, Blog post 4) and so I'm obviously excited to see it starting to open upto a wider audience. 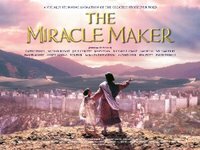 Having discussed The Miracle Maker before Easter, I thought I would just add this scene guide> I've done it a little differently this time. Firstly I've been able to add approximate times. Secondly, although I'm still broadly following my citation policy, I've also added references to Luke's gospel and have given it preference here over Matthew's. The film is essentially a version of Luke's gospel, both in form and function. From a functional point of view it was created by Christians with a view of telling their story to those who don't know it. Luke's gospel is often called the "most evangelistic", and this seems to have been a key motivation for making this version. From a form point of view, not only the does the film follow the synoptic order of events, it also prioritises texts from Luke. So prior to the resurrection, all but 3 episodes shown are found in Luke's gospel (indicated by an asterisk*). After the resurrection the script switches to John as the primary source, such that there are a further 3 episodes not found in Luke. However, the shape of the narrative at this point remains Lucan with the discovery by women, Simon seeing Jesus (24:34), the appearance on the Road to Emmaus, and then just a single appearance to the disciples in the upper room. The Johanine inclusions are more flourishes within that broader narrative than the text that defines the text of the narrative. This made it hard to cite the relevant texts for this part of the story! Secondly, the story contains 7 episodes that are unique to Luke, with several others (such as the baptism scene) prioritising Luke's version over the other gospels. This is the most for any of the gospels, although a number of incidents are unique to John. Interestingly these are often moulded far more significantly by the screenwriter (Murray Watts - who deserves a great deal of credit for his skilful writing here). 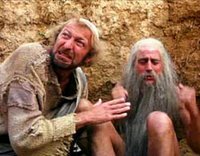 This film is also the only film that shows the Road to Emmaus episode, although the Genesis Project's extended version of Luke (from which the Jesus film was edited - see scene guide) obviously had to include it. 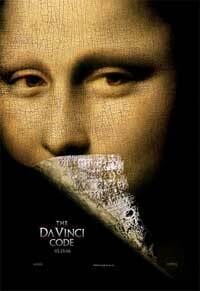 I finished reading the "Da Vinci Code" last week, which I thought was something I really ought to read both because so many people have already read the book, and to get some background for when the film comes out next month. The book has been hitting the headlines again in it's own right recently because of the court case which recently found in author Dan Brown's favour. Brown was being sued by Michael Baigent and Richard Leigh. Having read the book, any vague doubt I felt about my feeling that those authors were jumping on Brown's bandwagon (in what I can only imagine was an attempt to get a bit of extra cash) has disappeared. As Lesa Bellevie said in one of her posts at the Magdalene Review, "how, exactly, is a novelist supposed to 'correctly' credit a source?". Brown has tried as hard as he could, both in naming one character after the names of Leigh and Baigent (Teabing), but also in having said character discuss the various works that developed and popularised the theories on which it is based. Baigent and Leigh's book "Holy Blood and Holy Grail" is itself discussed by Sir Teabing for several lines. But there are plenty of other news stories about the book. 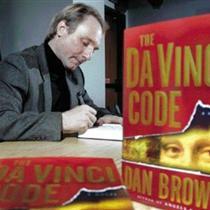 Just this weekend Peter Chattaway passed on the claims that 1 in 6 believe the "Da Vinci Code" is true. I haven't seen the source of the research from the two articles that Peter cites, so I can't quite work out what was actually asked, but it appears that the people weren't asked about belief in the "Da Vinci Code", but instead whether they believe Jesus's death was faked, and whether he had kids. Yet, Brown's novel never suggests Jesus's death was faked (quite the reverse). There seems to be a convenient media blurring of the edges at work here. Furthermore, the "Da Vinci Code" makes a large number of unusual claims. Even if people were asked whether they believe the "Da Vinci Code" it is doubtful a "yes" answer would mean they accepted all of them in the way a "yes" does when people are asked if they believe the bible. Putting the media coverage aside, what of the actual book? In it's favour it is certainly a gripping read. Right from the start the reader is drawn into the midst of what is happening, and wants to get to the bottom of things. Ultimately things get a little tedious, but for most of it's 600 pages it maintains the suspense really well. This alone meant that I found the book far more engaging than I had expected it to. The appearance of a new puzzle to be solved every 30 pages or so works as a nice device for giving the book momentum. On the downside I found that despite its 600 pages I never really came to care about any of the characters. Sure I didn't want them to die or go to jail, but the characterisations were just a little too thin. Instead much of those 600 pages were spent in inserting meaningless details, that bore no relevance to the plot and mainly seemed to be included because they had turned up during the research, and Brown had either found them too interesting to leave out, or had included them just to reinforce the message that, yes, he really has done his research. One of the other things I didn't like about the book is the use of pigeon-French. Thankfully by the end of the book, once things move to England the use of French subsides, partly because they are in England, but also partly (I suspect) because it just slips off the radar. It's a relief when it does, because much of it just seems a bit pretentious and patronising. It is particularly annoying when a conversation starts off in French, but then starts translating the more in-depth conversation, simply inserting words like "he continued in French". A minor gripe perhaps, but there were times when this made me laugh out loud. There were two sections in particular that I disliked, which I simply can't believe the books editors didn't remove. The first comes in chapters 72, 76 & 77 which is seeking an ancient word of wisdom. Thanks to a very basic grasp of Greek I suspected the moment I head it the word would be sofia, particularly as the lead female character is called Sophie. Apparently though, despite being an ace cryptographer, and granddaughter of a master of codes and meanings, Sophie is completely unaware of the meaning of her own name, leaving two professors scrabbling around to try and work that out. Really? The second such section is chapter 92 when Langdon and Sophie arrive in the Library at King's College. For some reason Brown seems to think it is necessary to explain to us at length just how to use a search engine. 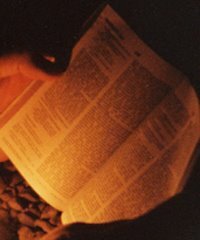 It is of course the theological "claims" of this story that have garnered the most attention, (and here the ending is perhaps most disappointing), and I suppose some people will find its claims credible, but really the whole story is something of a spiders web: No piece is strong enough to hold the book's claims alone, instead it has been cleverly spun together from facts and/or assertions to trap the unwitting reader. Some of the individual steps hold far more weight than others, but ultimately it's composed of very little substance; its strength lies only in the way it's spun together. Or putting it another way - it's full of holes. Yes Jesus could have been married, the argument from silence is based on our cultural assumptions not those of 1st century Judaism. If he had had a child I think we probably would have known about it, but even so it does not affect who he was and what he did. Yes the church has oppressed groups down the years, and whilst that sullies our record, it does not automatically mean that those we oppressed were the bearers of the real truth. Yes the church has borrowed imagery from other religions including paganism. Yet, that in itself does not mean that the concrete reality behind the borrowed metaphors is false. Four things disturb me about the Christian response to this film. Firstly, that there have been so many conflicting opinions, boycotting, dialoguing, watching other films and even ignoring them. Mark Moring over at Christianity Today has done a wonderful piece on this (thanks to Jeffrey Overstreet for the tip off). For some reasons Christians feel threatened by this and don't know how to act. Secondly, that there has been so much written about the book in response that it's starting to look suspicious. I don't mean so much the written-for-free opinion pieces (like this one), nor the journals that are covering it as they would for anything else. No, what dismays me is the myriad of books being written in response. It's worth having a few - let's face it one book would not suit all - but to have quite so many just rings of trying to make quick bucks, and gain a bit more influence, or reputation. Thirdly, so many of the responses seem to be answering the wrong questions. Much of the attention seems to have focussed on the "was Jesus married" question. As I said above, whilst most Christians would probably say that he wasn't married, from a theological position, it makes no difference. Quite simply, the bible never says he wasn't married - it's open to interpretation. Were he to have had a child then that would be more significant, but again it is arguing from silence, and has no impact on Jesus himself. What is more crucial is the questions the book poses about the history of early Christianity, how certain views gain precedence over others how we came to possess the bible we have today, what came to be defined as orthodox. It is here that the bible is most challenging, but here that there is much less material debunking these claims. Which leads me on to my fourth point - that much of this mess is of our own making, and no-one seems to say it. Protestant Church leaders have by and large neglected to teach their congregations about the roots of Christianity. It wasn't a simple process, which does raise a few questions. As a result it's been seen as a bit too embarrassing and been shrouded in mystery, and nudged towards the sidelines in the hope that no-one will ever ask about it. Unfortunately, now people are asking about it, and the church is so undernourished in this respect that it doesn't really know how to respond. The sad thing is that there is a solid case for the various processes and church councils, but unless people know about them then they are blown about by the wind. I'd like to make one final point. Brown's book has caused many to laud the power of story telling. In some ways it's good to see story telling back on the agenda, for as Christians, we have a great one to tell. In other ways though, story telling has been absent from our culture for a while, and as a result we have forgotten how to take it. On his website, Brown makes a number of interesting statements. He implies that he himself doesn't believe everything in his books, and claims to be a Christian. Yet he has been very selective of the evidence his characters espouse and has them exaggerate some of the historical details to make their case more believable. Why? Perhaps it's simply because it makes good fiction. And fiction, by definition, doesn't need to be true. 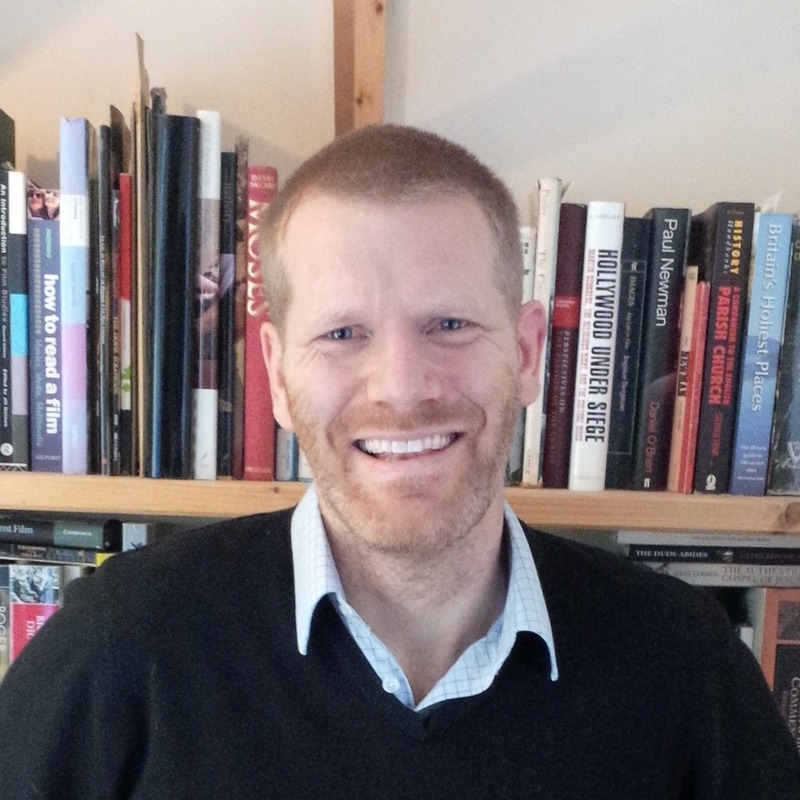 However, Brown also stresses that he hopes his work of fiction will "serve as a catalyst and a springboard for people to discuss the important topics of faith, religion, and history." It is certainly doing that, on a scale far beyond what he would ever have expected. At the same time I think Josh McDowell could well be right when states that "truth will always stand". The question is will the church "be ready to give an answer to everyone who asks" in the meantime? 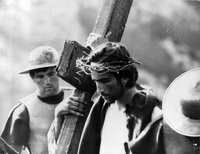 I've been away over Easter, and so haven't had the opportunity to discuss the Channel 4 documentary on Bible Films The Passion: Films Faith and Fury, which I mentioned previously here, here and here before it was broadcast (and before I had seen it). The marketing for the film (including quite an interesting TV ad) suggested that the film would primarily be concerned with the relationship between film-makers and the church over the last 100 years and this was certainly the main thrust of the documentary. After a brief introduction, presenter Robert Beckford took us back to the start of the film industry and charted the relationship between these two bodies across the last century. One of the biggest strengths of the film was how it skilfully wove together an overview of the history of the main biblical films with the confrontation that accompanied them to give the programme a strong narrative arc which was far more engaging than that of other similar documentaries such as The Bible According to Hollywood which plod far more formulaically from epic to epic, without having much fresh information to impart. There are quite a few I've not been able to recall, and won't be able to dig out exacat numbers and all names until I get the chance to watch this again. However, the interview snippets certainly added to the structure of the film, and many of the comment were insightful and helped develop the narrative, rather than simply having a handful of celebs repeating the same inane comments in order to make the show more appealing, as is often the case with programmes like this. Another strength of the documentary was Robert Beckford whose presence alone gives the film theological credibility and cultural relevance at the same time, and is an ideal choice for a film seeking to weld those two aspects together. He also seemed to represent the middle ground between those Christians on the one hand that are now seeking just to do their own thing, and film industry potentially leaving bible films alone for the foreseeable future, and his pleas for Hollywood to keep making them were a particularly effective way to end the film. That said, whilst I share his concern that Hollywood might leave the bible to the Evangelicals to get on with filming, there have been a number of films commissioned since then, and I suspect that The Passion of the Christ will have made Hollywood realise that their is money to be made here again. The real plea needs to be to film-makers who are primarily making films for the sake of art, rather than profit. It was also a shame that Christian film critics seeking to take a more dialogical approach with the cinema (such as the Faith and Film Critics' Circle) didn't really feature in the discussion towards the end of the programme. There were a few surprises as well. 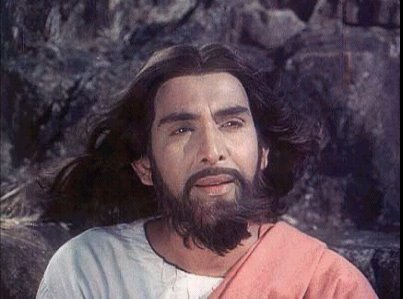 I for one, was amazed to hear about an Indian Jesus film called Dayasagar which was unknown to me previously (picture right). It fulfils a similar role in India to that of the Jesus film, although from the brief few snippets we were shown it was obvious that it is much more relevant to Indian culture than Jesus. If anyone has seen, or knows where I can hold of a copy I'd be very pleased to find out. Finally, I should comment on my parts. There were two brief shots of me - a sound-bite on Intolerance (1916) and another on The Ten Commandments (1956). I was greatly relieved not to have mumbled, been heretical, ugly, excluded at the last minute, said something foolish or quoted out of context, and fairly pleased at what I said. I was surprised at the bits they used though. I didn't remember saying much about Intolerance and thought that they would have plenty of other material for The Ten Commandments. I also recognised part of the script as being similar to an article I wrote back in 2004. Given that the publication I wrote the article for never used it, it was nice to see the work I put into it bearing fruit. Overall then it was well worth watching, and I was very happy to have been part of it. If you live in the UK, and missed it, you'll be pleased to know there is a repeat showing at 1:40 am on Saturday Morning (22nd April). Edit: You can now see just my excerpts from this film on YouTube. Channel 4 Web Page for "The Passion: Films, Faith and Fury"
I've already blogged info here and here on the Channel 4 Bible Films documentary which I'm featuring on Saturday (April 15th). However, Channel 4 have finally put their own web page up for it. "The Passion: Films, Faith and Fury". There's also a slightly sniffy review of it at the Radio Times. More of a film than The Life and Passion of Jesus Christ, more natural and genuine than DeMille's The King of Kings, This film, for me, stands out as the best Jesus film of the silent era. Controversial in it's day, for its very existence, (not to mention its ommission of the resurrection), Sidney Olcott's film has a quiet dignity about it, which is best captured by turning off the overbearing sountrack which was added later. 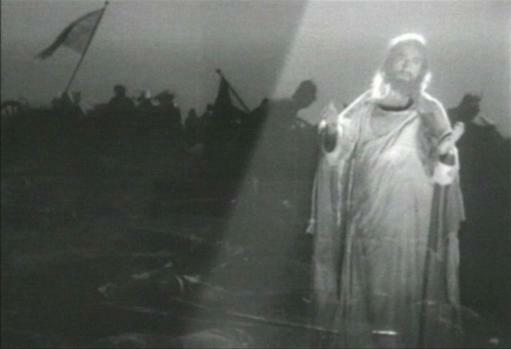 The film was re-issued with a resurrection scene in 1916 as Jesus of Nazareth, and under that title again in 1932 with sound. Golgotha was the first Jesus talkie, and set a high standard for those that were to follow> originally released as Ecce Homo. Julien Duvivier's use of the camera was way ahead of his time and he manages to capture the miraculous events in Jesus's last week as if they were the most natural thing in the world. 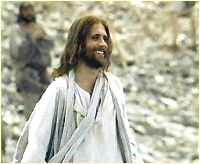 The first Hollywood film about Jesus since the end of the silent era 34 years earlier. King of Kings remains enjoyable even though behind the scenes power stuggles destroyed the films promise. The Sermon on the Mount scene is still wonderful though, even if elsewhere Jesus is squeezed out of the film by the zealots. Widely considered the masterpiece of the genre, at least among film critics, Pasolini's neo-realist style gave us a Jesus of the people, who delivers his pithy sayings with revolutionary urgency. The camera work draws the viewer into the story more, whilst the use of ordinary people cuts through the gloss of so many Jesus films both before and afterwards. The Godfather of neo-realism was Roberto Rossellini who ended his career with this film. Like Pasolini's film, Rossellini depicts a peasant Jesus, who continues his carpentry even as he teaches, and whose followers pass on his message at the same time he does. Of all the versions of Jesus in film this one perhaps focusses the most on his teaching. 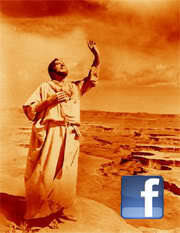 The film is also unusual for it's opening scenes from the time of Samuel. One of my least favourite films in this list, and yet where would the genre be without it? 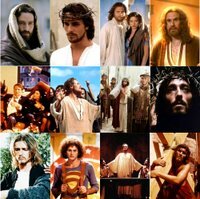 In many people's eyes the definitive film Jesus, and a favourite amongst the faithful, Zefferelli does so much very well. Sadly, his leading character is dreary, and the film drags on without a charismatic compelling lead. That said the other performaces are wonderful and the period detail is impressive. A mixture of the good, the bad, and the dull. In parts Scorsese's film soars breathing new life into the character of Jesus and challenging the viewer about their cosy pre-conceptions. In other places though the film, is just bizarre and has offended many, whilst still other places seem to drag. For those looking for fresh insights and who like to judge films on their merits there is plenty to be mined here. For those who find whole films are spoiled by particular sections stay away, particularly if you are easily offended. Jesus explores similar territory to Last Temptation, but in a safer more palatable form. Sisto's performance has many strengths, but it slightly spoilt by a few too many scenes of of him goofing around. That said the early scenes are particularly strong. Much of it is speculation, but certainly such that is within reason. It's also one of the few films to clarify that that it was the Romans, not the Jewish leaders that were in charge in Jerusalem in Jesus's time. 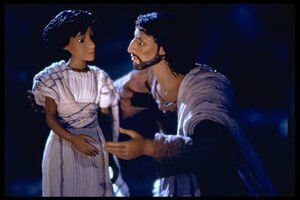 The claymation version of Jesus's life is one of the genre's highs. Whilst clearly less arty than Pasolini's film, it is theologically, and historically strong, and surprisingly moving for a stop motion film. Ralph Fiennes does an excellent job as the voice of Jesus, and Murray Watts's scripts is excellent but the most credit must go to the team of animators who produced a wonderfully realistic and creative film. Whilst there are several troubling aspects of this film Mel Gibson did plenty of excellent work with this as well. The film looked incredible, and whilst it starved us of insights into Jesus's earlier life, the few scraps we were allowed certainly aroused our appetites for more. And as filmic meditations on the stations of the cross go, I doubt it will be surpassed. There are a few films which I had to exclude, for various reasons, but which really deserve a mention. Son of Man isn't really a film, it's the filmed version of a Dennis Potter play. Nevertheless it remains one of the strongest visual portrayals of Jesus to date. Colin Blakely portrays a Jesus with fire in his belly, who speaks in the language of normal people, but in a manner that makes his collision with the authorities inevitable. The Sermon on the Mount scene again is amazing, and deserves repeated viewings. This is excluded form the list becuase it isn't actually a film about Jesus (although he makes a brief cameo at the start). Instead it's about the folibles of religion, and of humanity in general. Life of Brian does what all good films do - be excellent at something. In this film's case its comedy is hilarious hwilst remaining thoughtful. As a result it has gained a dedicated following, and appears time after time in those "best of" programmes. Jesus of Montreal is another satire, only this time the target is modern day Quebec. 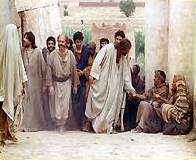 The film follows five actors as they put on a controversial passion play which and finds the life of the groups leader mirroring that of Jesus whom he plays in the film. Perhaps the strangest scenes at a first viewing, is actually one of the best - where Jesus wanders through the subway proclaiming God's judgement in the style of Mark 13. Hal Hartley's film stars Martin Donovan as Jesus returning to earth on the eve of the new Millennium, and finding that his love for humanity conflicts with his mission. Another sharply observed satire which explores form as well as content. My friend Michael Leary has just started a new NT blog called Ekthesis, "because the New Testament is becoming cool again". He's actually a fair way into his Ph.D. on "Canon, Convention, and Context: A Literary Historical Reading of John 21". He's also an excellent film critic, and whilst it's been a while since he posted at his Image Facts blog, he's clearly been keeping up to date with his film interests (see below). There's already lots of interesting content, including one post detailing his paper for this year's SBL Annual Meeting. There is an interesting sub-genre of "Jesus films" that relates well to the "treatment of biblical themes in films that are not expressly biblical." This genre is distinct both from films that attempt to directly adapt the canonical gospels to the screen, and from films that simply feature a discernable Christ figure as a central theme. The films that populate this sub-genre rest somewhere in between, being filmed narratives that have nothing else to do with Jesus other than the suggestion of a title, a set of visual themes, or an abstract yet fully intentional nod to the nature of Jesus. This paper will outline the contours of this interesting genre by looking at three of its most effective examples, and attempt to identify the hermeneutics at play in such profoundly inter-textual works of art. At first glimpse, Bruno Dumont's controversial realist masterpiece La vie de Jesus is only related to Jesus by title. But beneath the surface of the film lies commentary about mortality and materiality that expands to fill the Christological brackets set by Dumont in the title. Gus van Sant's recent film Last Days narrates the last few days of Kurt CobainÂs life in the context of a loosely fictional stand-in that becomes increasingly cloaked in Jesus imagery until a final resurrection scene. 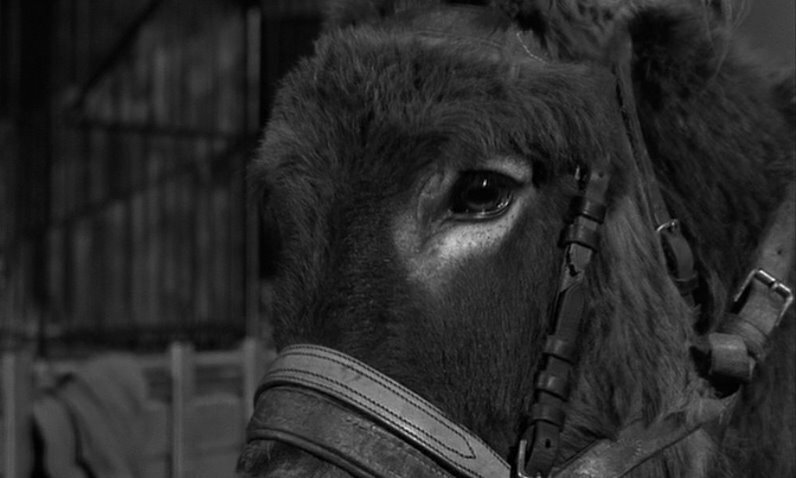 And finally, BressonÂs Au hazard Balthazar quite boldly turns a dilapidated donkey into a provocative metaphor for the odd presence of Christ in contemporary culture. All three of these films are intentional and provocative allusions to Jesus in decidedly non-biblical narrative worlds. This paper will track the reflective strategies of this "non-canonical" genre through these three close readings in their appropriate film theoretical context, and articulate the rich potential for re-narrating Jesus by means of the startling generic conflict embodied by these films. This sounds fascinating. I've only seen one of the three films he mentions, Au hazard Balthazar, but it is an incredibly rich film, even though it takes some work on behalf of the viewer. Sadly I won't be able to be there, but I'd encourage anyone who is to watch the films before hand and hear what Mike has to say. 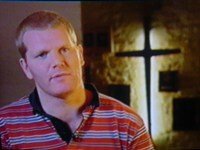 More on "The Passion: Films, Faith & Fury"
I've been searching keenly for a bit more information on Saturday's Channel 4 programme The Passion: Films, Faith and Fury, which I feature in briefly (at least that's what I've been told). When I discussed it last month there was only a small amount of information available. 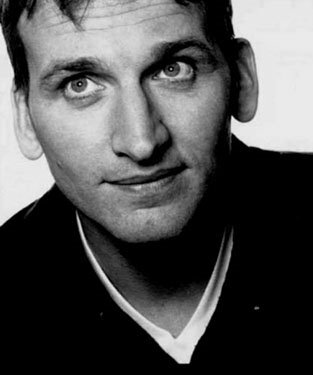 It was also unclear whether Christopher Eccleston or Robert Beckford would be fronting the programme. Anyway information is gradually seeping out, and although I've not seen it myself, it apparently has been advertised on TV. It seems clear now that it will be Beckford and not Ecclestone, as I suspected all along. I'm really not sure where the Eccleston association came from, and I suppose it's still possible that he might feature (although I suspect that would be included in the publicity). With the success of films such as The Passion of the Christ and The Chronicles of Narnia , and the imminent release of the movie version of The Da Vinci Code , the century-old relationship between Hollywood and the church is being thrust back into the spotlight. In a special two-hour Easter documentary Dr. Robert Beckford examines the complex connections between the two very different worlds and interviews some of the key players who have found themselves at the centre of controversy, including Martin Scorsese, Willem Dafoe, Terry Gilliam and Robert Powell. The documentary charts the rise of cinema and its uneasy relationship with the church, from the early filmed passion plays of the 1890s to Mel Gibson's The Passion of the Christ and The Chronicles of Narnia , via The Ten Commandments and The Exorcist , and by way of Jesus Christ Superstar and The Life of Brian . Sadly the programme is up against the latest instalment of Doctor Who?, which also won't be starring Eccleston, and starts quarter of an hour later at 7:15. That said, I suspect my bit will probably be towards the start, so you never know your luck! One thing I am glad about though is that the interviews were recorded months ago, rather than this week. I'm currently sporting 8 stitches in a gash across my forehead from a rugby match on Saturday. The Passion: Films, Faith and Fury, will be airing from 7 to 9pm on 15th April on Channel 4. I watched this again last week, and was reminded how much I liked this version of the Jesus story. It appears that despite it being relatively recent, it is largely unknown, at least outside this country. For those not in the know, I'll give a brief overview. The film was the product of a Russian / Welsh collaboration, by the same company who made the Testament: Bible in Animation series of 30 minute films based on stories from the Hebrew Bible. So this was the first (and still the only) feature length animated Jesus film. The majority of the film is shot using "claymation" (animation using plasticine / modelling clay as used by films such as Wallace and Gromit: The Curse of the WereRabbit). This style seems to be more popular in Britain than in America. I've enjoyed this film many times before. 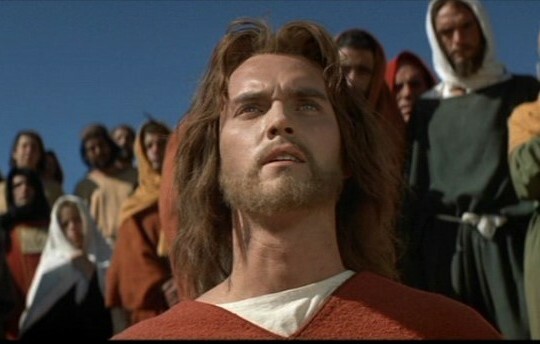 It was actually only the second ever Jesus film I had seen in the cinema (the first was Jesus (1979) years ago). What is remarkable about it is that despite being filmed using plasticine figures, it catches the humanity of Jesus more than any other film. At the same time it also does a good job of catching his divinity. Viewers familiar with a number of Jesus films will know that this is one of the issues that always come up when Jesus films are discussed. The earlier films emphasised his divinity by making him seem s remote and detached. By the time King of Kings came along in 1961, film-makers were beginning to talk about putting more emphasis on his humanity, but seemed unable to free him of this remoteness. Conversely more recent films have continued in the quest to portray a more human Jesus, but seemed to have sailed straight past the target. 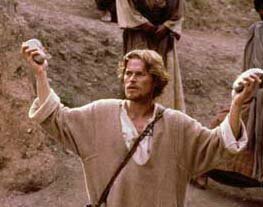 Last Temptation of Christ portrayed a man wracked by various emotional disorders - as, I think, Lloyd Baugh pointed out, it is not the film's low view of divinity that is the problem, but it's low view of humanity. Other recent films such as the Jesus mini-series that was also released in 1999, and 1996's The Visual Bible Matthew are trying so hard to portray him as someone who liked to laugh that he ends up too much of a clown, and lacking any sense of substance. Somehow The Miracle Maker seems to get this just right. Jesus is incredibly good with people, he uses gentle humour in his teaching, and knows how to smile, but never compromised the sense that this is someone significant. Perhaps it's Ralph Fiennes's voice that does the work, or the fact that not using an actor makes it easier. Either way it's an incredible achievement, and one that has moved me to tears in the past. 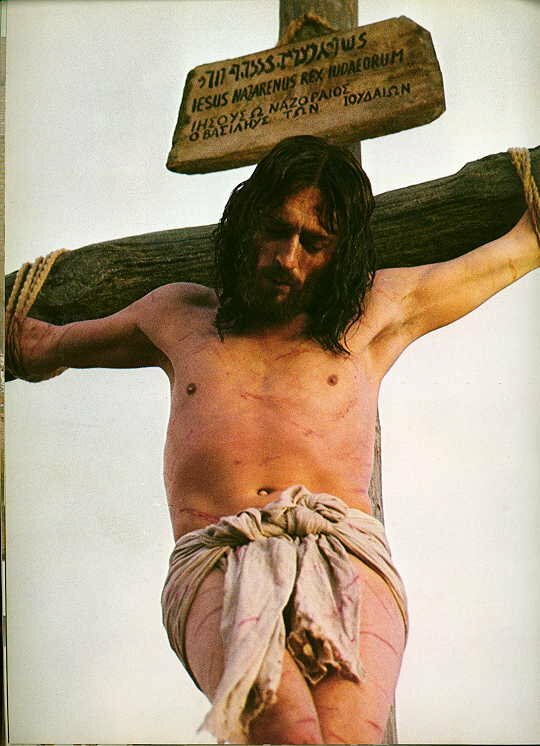 Strangely, I was never that moved by The Passion of the Christ. There are other things I have always loved about this film. The use of animation is excellent. For those who have not seen it, whilst most of the film is claymation, there are several scenes shown using 2D hand drawn animation. These scenes are the ones that are either flashbacks (such as the nativity episodes), or more supernatural (such as the deliverance of Mary Magdalene), or for Jesus's parables and teaching. There are numerous results of this. One is that it helps keep younger viewers engaged. Perhaps most significantly though, is that it allows the film to be more emotional and expressionistic at these more imagery-rich moments of the story. That said, this time round there were a few things I really only noticed for the first time. Perhaps most significantly I was struck by how historically rooted this version of the Jesus story was. I kept thinking Tom Wright would like that, and thus wasn't surprised when both he, and the now Archbishop of Canterbury Rowan Williams were both named as advisors at the end of the film. For example, there is a scene between Pilate and the centurion long before the crucifixion where they discuss the revolt the centurion has just put down by crucifying 117 rebels. Whilst I believe the timing of this incident is not based on a specific historical incident, it does emphasise what most Jesus films miss - that Jesus's execution was, from a Roman point of view, nothing out of the ordinary. Later on there we are shown the post-resurrection appearance to Cleopas and companion on the Road to Emmaus. Whilst the exact quote escapes me, there is also some discussion here of what resurrection actually meant in that period. Which brings me on to another thing I like about the film - the attention given to the resurrection. This is probably the section of the gospels filmed with the most variation and creativity of all. Whilst some films have excluded it all together, such as Son of Man (1969), others have taken more creative, but ambiguous, interpretations (Jesus of Montreal, Jesus Christ Superstar, Last Temptation of Christ). Of those that have chosen to show a more literal interpretation, they have either given it relatively short shrift (Jesus of Nazareth) or eschewed the biblical accounts and replaced them with their own interpretations of what happened (The Passion of the Christ). In contrast, The Miracle Maker shows Mary finding the empty tomb (John 20:1)and then meeting the risen Jesus (John 20:11-18), Mary telling Peter, and him running to the tomb (John 20:2-7), Peter meeting Jesus (a fictionalised abbreviation of John 21:15-19), The Road to Emmaus (Luke 24:13-35), And the second appearance to the disciples, including Thomas (John 20:36-41), and the Ascension (Luke 24:48-53). I'll post a full scene guide in a few days, but if you fancy watching a Jesus film at some point over the Easter period, and you haven't seen this one yet, then I'd strongly recommend it. I've also now written some notes on my Scene Guide.